It all started with Lucas of The Chemist in the Bottle hearing on the radio some random person pronouncing the upcoming February to be a month of roses. While he wasn’t sure what the reason for that statement was, he came up with the idea to wear rose perfumes every day of February first, and then, once he realized that he didn’t have enough rose perfumes to pull it off on his own, he invited his readers to take a part, and based on everybody’s responses Lucas created a calendar of who will be wearing which perfume and on which date. My guess was that February got that flower designation because of the Valentine’s Day. This holiday has enthusiastic followers, reluctant participants and “conscientious objectors.” I am firmly in the first camp but I know one of the widely used reasons – a variation on “You should show your love year round – not just on Valentine’s Day!” So the idea of celebrating the whole month, without making it into a single day occasion, appealed to me even more. I decided that I would wear rose-centric perfumes every day in February. I created my own calendar. It follows the Calendar of Lucas for those days that feature perfumes that I like and have in my collection (presented in bold), and for the rest of the days I chose alternative perfume. To get 28 perfumes that I like and do not mind wearing, I had to make an exception to my usual rule that I wear only perfumes from bottles or decants, so there will be some sample vials (including a dab ones) but I’ll try to give every perfume a proper “skin time” during the day. I invite you to participate in this Month of Roses. 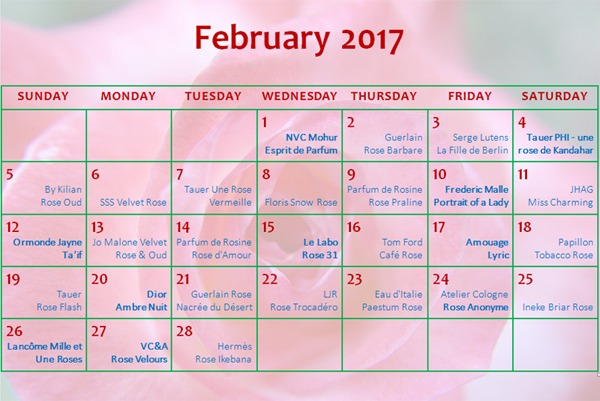 Wear rose perfumes from either calendars, or come up with your own choice. Do a month of rose perfumes, a day or anything in between. I know that you come here for the company (and pictures of Rusty) so I hope to have a regular conversation on or around the suggested topic. But if you choose to take a part in this spontaneous group project, each comment you live telling me, which rose perfume you’re wearing that day, will give you one entry into a giveaway. I’ll do the math in the end, and you could always refuse the prize, so I suggest we skip altogether the part where you tell me to enter, or not to enter (that’s not the question). Use this post for comments about perfumes worn during the first week – February 1st – 7th. What’s the prize? I’ll be original for a perfume blog draw and banal for Valentine’s Day offerings: chocolate. Winner gets two bars from a local artisan brand (my choice) – milk, dark or mix (winner’s choice) sent anywhere in the world (and I won’t even have to be creative on the customs form).